Do you want to access PlayStation Vue from abroad? In this post, we’ll show you how to live stream PlayStation Vue content no matter where you are in the world. Using a Virtual Private Network (VPN) you can bypass geo-restrictions and watch PlayStation Vue live online from countries outside of the US. Streaming platforms often employ geo-locking measures to prevent viewers outside of their broadcast region from tuning in. However, VPNs enable users to connect to servers in different countries. You’ll be assigned a temporary, region-specific IP address, which tricks the site or service into believing you’re actually located somewhere else. Additionally, VPNs increase your online security by encrypting your traffic. This renders it unreadable to anyone who may be monitoring your connection, including hackers, network administrators, or internet service providers. Sign up to one of the VPNs below (we recommend ExpressVPN). Download and install the software. There will be several different versions so make sure to get the right one for your operating system. Try accessing content from PlayStation Vue. You should find that it loads almost instantly. 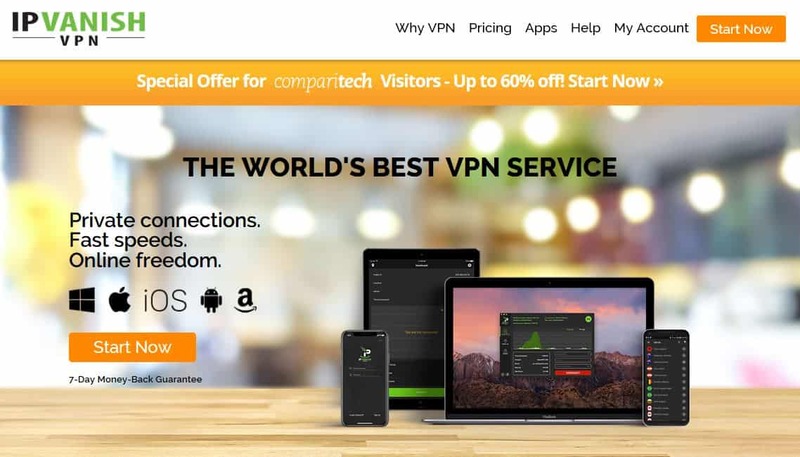 GET A PREMIUM VPN FREE: Often, VPN providers only offer their lowest prices to customers willing to sign up for years at a time. However, if you only need a VPN for a short time, or just want to watch one specific event, you can take advantage of ExpressVPN’s 30-day free trial. An upfront payment is required, but you can cancel within 30 days to receive a full refund. 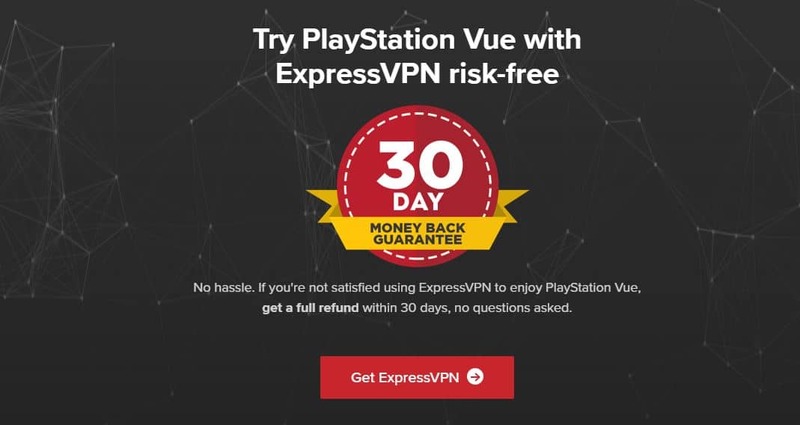 ExpressVPN is an excellent choice for streaming PlayStation Vue. It has 28 US servers, spread across 18 states, and has a negligible impact on your network speeds. Further, this is one of the few VPNs left which can consistently bypass the aggressive geo-restriction measures employed by platforms like Netflix and BBC iPlayer. With three simultaneous connections permitted, you can protect your most commonly-used devices with a single account. This service keeps you safe online using a combination of 256-bit encryption, perfect forward secrecy, a kill switch, and DNS leak protection. Best of all, ExpressVPN doesn’t log any information that can identify you personally. If you run into any issues, you can contact customer support via live chat, 24/7. ExpressVPN features apps for Windows, MacOS, Linux, Android, and iOS devices. It can be installed on supported wireless routers, although this requires manual configuration. EXCLUSIVE DEAL: Our readers can save 49% and get three extra months free by signing up to ExpressVPN’s annual plan. This comes with a 30-day money back guarantee. Try it out, and if you’re unsatisfied, you can cancel and get your money back. NordVPN has one of the largest server networks of any major VPN service. There are over 1,900 servers to choose from in the US, with some dedicated to HD streaming. 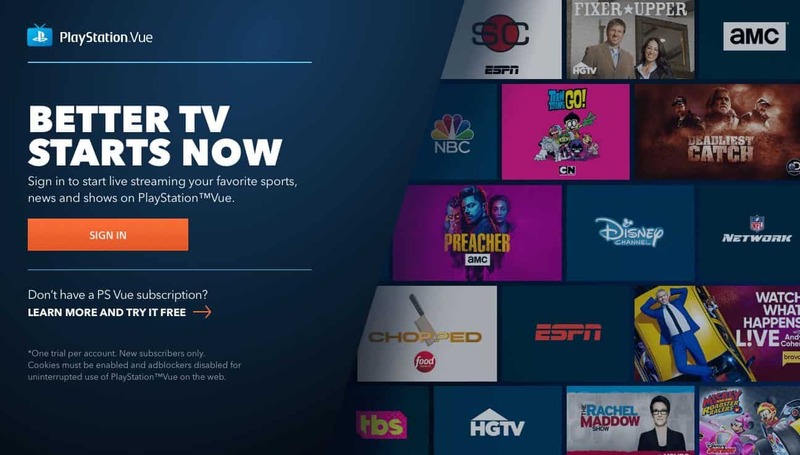 In addition to bypassing PlayStation Vue geo-restrictions, it can reliably unblock popular streaming platforms like Netflix, Hulu, and Amazon Prime Video. Security is where NordVPN really stands out. It uses 256-bit AES encryption and provides users with a highly customizable kill switch, protection against DNS/IPv6 leaks, and several more advanced features. These include the ability to use double VPNs, connect to Tor with a VPN, and automatically block ads or malware. NordVPN doesn’t log any personally identifiable information, so you know your activities will be kept private. This service has dedicated apps for MacOS, Windows, iOS, and Android. Manual installation is required for Linux-based platforms and supported routers. 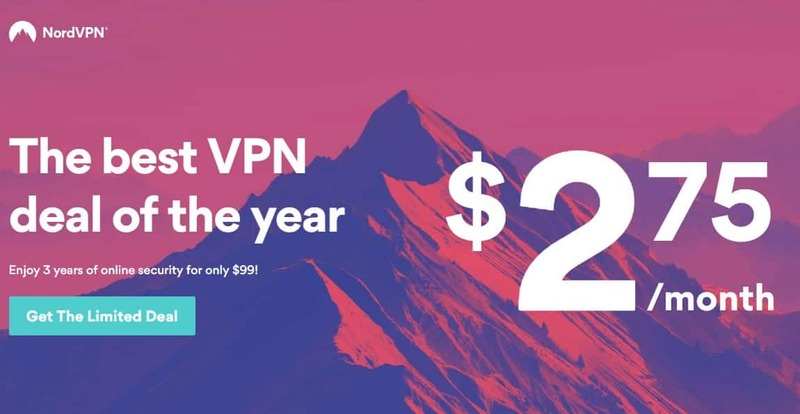 SAVE 77%: Choose NordVPN’s three-year plan and cut the price by a huge 77%. This reduces your monthly payment to just $2.75. CyberGhost makes streaming most geo-locked services very simple: just click the Unblock Streaming option and choose a service. Although PlayStation Vue isn’t mentioned by name, you can unblock it by connecting to one of CyberGhost’s 464 high-speed US servers. You’ll find that these are fast enough to stream live HD video without buffering or lag. This service is designed to be as user-friendly as possible. With 256-bit encryption, a kill switch, forced HTTPS redirection, anti-malware checking, and ad-blocking, CyberGhost effectively functions as an all-in-one online security tool. No personally identifiable information is stored, and as it protects against DNS, IPv6, and port forwarding leaks, your activities won’t be revealed to anyone. This VPN offers Android, iOS, Windows, and MacOS apps. It works with Linux devices and selected network routers, although these must be configured manually. 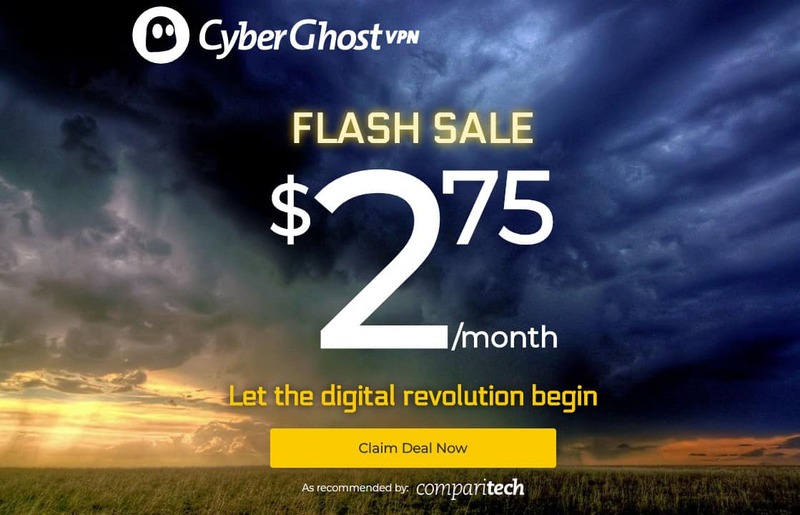 READER OFFER: Sign up for CyberGhost’s one-year deal and save 77%. What’s more, you’ll get an extra six months coverage absolutely free. With a 30-day money back guarantee, you can try this service risk-free. IPVanish has long been a favorite of users who like to stream video online. It offers exceptional multi-platform support, high speeds, and a huge selection of servers to choose from (479 in the US). With up to ten connections permitted at any time, your whole family can stream PlayStation Vue and lots more with just one subscription. With IPVanish, the benefits don’t stop at a user-friendly experience. This provider puts a major emphasis on security too. It uses 256-bit encryption, DNS and IPv6 leak protection, and a kill switch by default, but you can also block local traffic, obfuscate your data, and switch IP addresses at regular intervals. This VPN doesn’t log any data that could be used to identify you. IPVanish has lightweight, user-friendly apps for MacOS, Windows, Android, iOS, and Amazon Fire TV/ Fire Stick. It can also be manually installed on Linux-based systems and supported internet routers. EXCLUSIVE: Comparitech readers can save up to 60% on IPVanish subscriptions here. These come with a 7-day money-back guarantee, so there’s no risk whatsoever. Despite having just ten US servers, PrivateVPN is still worth your time. It offers higher speeds than many of its competitors and is capable of unblocking major streaming services including Netflix, Now TV, BBC iPlayer, and of course, PlayStation Vue. It allows up to six simultaneous connections per account, so you can protect all of your devices at once. PrivateVPN boasts 256-bit encryption, protection against IPv6 and DNS leaks, and a kill switch that stops data transferal upon disconnection from the VPN. Further, PrivateVPN doesn’t log any session or activity data, so you can browse as anonymously as possible. Live chat is available 24/7 and a support agent can even install the software remotely for you if you’d like. PrivateVPN has Windows, Android, MacOS, and iOS apps available. Select routers and Linux systems can be configured manually. ONE-YEAR DEAL: Cut the price by more than 70% and get an additional five months free by choosing PrivateVPN’s annual plan. Can I use a free VPN with PlayStation Vue? At first glance, free VPNs seem like an easy way to protect yourself online. However, we strongly advise against their use, for several reasons. These services have a constant influx of users but lack the server infrastructure to handle them. In practice, this means you’ll experience very slow browsing speeds, stuttering video, and sporadic disconnections. Further, PlayStation Vue has tried its best to prevent VPN users from watching anything. As such, free VPNs likely won’t work to unblock the service in the first place. Like any business, free VPNs exist to make money. They don’t charge the user directly, but they use other methods to turn a profit. You’ll often find that free VPNs insert ads into the pages you visit, but they can also use tracking cookies to follow your activities even after you disconnect. Detailed logs of your browsing habits can then be sold to third parties without your knowledge. Finally, there’s no guarantee that the free VPN you use will be legitimate. A recent study showed that many free “VPN” apps actively tried to install malware on the user’s system. Even the ones that didn’t, were shown to have various security flaws, assuming they actually encrypted your data at all. Even if you opt for a popular free VPN, you could still be at risk: just a few years ago, we saw one sell its users’ bandwidth to help facilitate a botnet. When it comes to online security, you can’t be too careful; we recommend using a trusted, reputable VPN that puts its users’ privacy first. Can I sign up for PlayStation Vue? If you’re using a VPN, you won’t see this message, and instead will be able to start the signup process. However, even if you’re opting for a free trial, you’ll need to enter billing information, and the only country option for the credit card billing address is the US. Unfortunately, there’s no easy or reliable way around this restriction unless you have a friend in the US willing to sign up for you. What devices can I use for PlayStation Vue? It’s worth noting that you don’t need a PlayStation to use PlayStation Vue. While there are native apps for PlayStation 3 and 4, you can also tune in via Roku, Amazon Fire TV/ Fire Stick, Android, iOS, Apple TV, Chromecast, or the web player. Although some of these systems lack native VPN apps, you could install a VPN on your home router. This will automatically route traffic to and from all connected devices through your chosen VPN server. Additionally, you could choose to use a virtual router. How much does PlayStation Vue cost? PlayStation Vue’s least expensive package, Access, includes 48 different channels and costs $44.99 a month. However, prices can go as high as $79.99 per month if you want to add sports coverage, movies, or other extra channels. Additionally, certain add-ons aren’t available as part of any one plan: if you’d like to watch Spanish-language content, for instance, it’ll cost an extra $4.99. There are free trial periods available for some packages. You will be required to register a payment method, but if you decide the service isn’t what you’re looking for, you can cancel without being charged. What can I watch on PlayStation Vue?